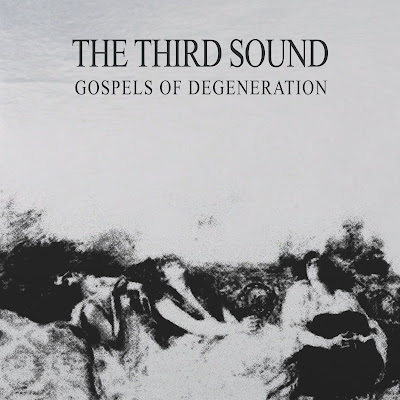 “Never Catch Her Again” is the second single from Gospels of Degeneration, the upcoming third album from the Berlin group described as ‘Anton Newcombe protégés.’ The album will be released by Fuzz Club and follows their self-titled debut album which was released on A Recordings, and their second LP The Third Sound of Destruction and Creation which was recorded in Newcombe’s studio and released on Fuzz Club in 2013. “Never Catch Her Again” follows down the same murky paths as “You Are Not Here”, the first single from the LP featuring Tess Parks on vocals. However it replaces the country-inspired sultriness described by the UK’s Clash Magazine as “a languid smoky piece of psychedelic rock”, with a compulsive amalgamation of post punk and lethargic psychedelia. Fuzzed-out guitars wash through a wall of feedback, underpinned by churning bass and languid percussion. It shows a shift for The Third Sound, toning down the shimmery psychedelia in favour of something a little cleaner, but still retaining their hypnotic layering and itching guitar riffs that keep whispering through your mind for hours after listening. What began as the project of Icelandic frontman Hakon Aðalsteinsson (ex Singapore Sling), The Third Sound is now stretching its definition with deeper levels of collaboration between band members and the influence of a new character in its story, the city of Berlin where the group are now based. The shift in direction is matched by a confident disregard of contingency as the band flicks between waltzing post-punk cuts and country lilts with seeming indifference. It feels as if their assuredness has provoked them to go on the hunt for new sonic niches that they can confidently take reign of. The Third Sound will be touring the UK and Europe in June including a performance at Fuzz Club’s new monthly mini-fest Under The Arches on June 4th. Founded by Icelandic frontman, Hakon Aðalsteinsson – an ex-member of Icelandic group Singapore Sling, who are often hailed as the founding members of the new psych scene – The Third Sound came into being in Rome and have since relocated to Berlin. The Third Sound is Hakon Aðalsteinsson, who creates the concept for each song and writes the lyrics, guitarist Robin Hughes who develops the guitar parts, Leo Kaage on drums. The trio co-produced the album, which was recorded in Berlin in Kaage’s homebuilt studio with gear that was begged, borrowed and stolen from friends and collaborators.